Throughout many parts of the Midwest and Northeast, insect scale crawlers have emerged and begun feeding on a number of trees and shrubs. Crawlers are the newly hatched scales. In some additional regions of the country they have already emerged and are starting to cause problems. They are highly mobile and do not have the protective cover. Crawlers are usually very small and may be difficult to see. 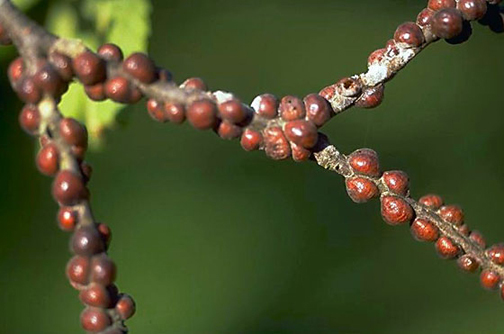 Scale insects are generally categorized as either armored scale or soft scale. Armored scales secrete a protective cover over their bodies and usually overwinter as eggs beneath the female cover. Soft scales are usually larger, lack the protective cover, but protect themselves with waxy secretions. Most soft scales overwinter as immature, fertilized females. 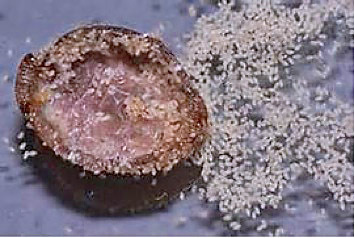 Scale insects feed on plant sap. With their piercing mouth parts, scale remove plant sap causing yellowing of leaves, reduced plant vigor, and branch dieback. Soft scale excrete, a sweet, sticky material called honeydew. The honeydew drips onto the foliage and branches below, which often attracts other insects. Also, an unsightly dark fungus called black sooty mold is commonly found growing on the honeydew. 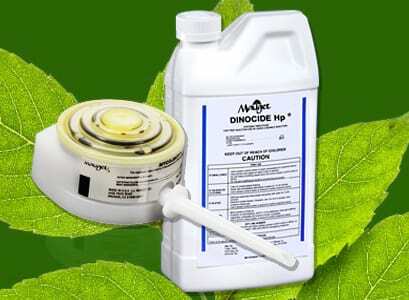 An injection of Mauget’s insecticide Dinocide provides effective control for many types of scale. The active ingredient in Dinocide is translaminar which means it is in both the xylem and the phloem. Dinocide moves through a tree quickly and will begin controlling scale 3-5 days following injection.